Jaylen Brown in glasses? Now, really, doesn't that fit. Chess player, intellectual, mentally-focused individual. It all fits. Wearing protective lenses tonight against the San Antonio Spurs, he will really look the part. 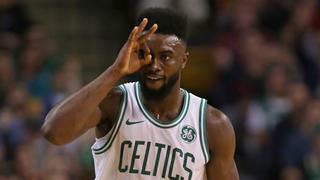 Jaylen is dealing with an inflamed eye, possibly a reaction to a contact lens. Brown has been compared to former Laker, James Worthy, an absolutely devoted eyeglass wearer. Worthy wore glasses for most, or all, of his career. 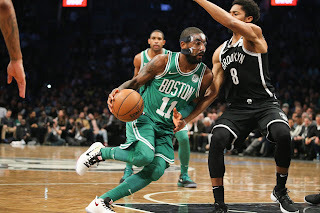 But Jaylen would be the first to indicate, "Oh Lord, I am not Worthy" just as Cedric Maxwell was not Kurt Rambis another former Laker. The video below is terrific and shows Max kidding with young Lakers fans dissing Cedric and praising Kurt while wearing Rambis glasses. The Worthy-with-glasses photo is to the right. Those are not glasses. Those are goggles. Great protection, but they enhance nothing. That won't work for Jaylen. He needs the high-school-nerd type - you know, the kind worn by the studious intellectual that goes on to become a Theoretical Physicist and make a lot of money. We see a good balance between fashion and protection in the tweet below. Those are apparently what Brown will be wearing. Like Worthy's goggles, there is absolutely no fashion in face masks. So if you can't have fashion, you have to look for some type of enhancement. Frankly, I liked the black mask rather than the clear one. Kyrie Irving is frightening enough already to his defenders with his jackhammer dribbling, sleight-of-hand moves and deadly scoring ability. Add the black mask and you have a fearsome opponent indeed. Something right out of a Halloween movie. So it looks like Jaylen's glasses will be closer to Kurt's than James'. 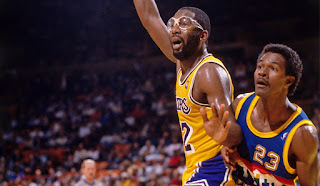 One fine feature of the Rambis glasses, other than the fashion statement, is that they remain firmly in place while the wearer is being pummeled by an opposing player. Take notice in the video below that Kurt's glasses don't even end up askew after getting clotheslined by Kevin McHale. A perfect case of fashion and function coming together. As an aside, we talk a lot about length and wingspan. Look at Kevin McHale standing after the incident and notice his height and arm length. He could have been several more feet away from Rambis and still taken him down. In the above Maxwell video, Cedric seemed to have a vision problem after donning the Rambis spectacles (or maybe he was just kidding). Hopefully, Jaylen will not experience the same issue. I agree with Brown's eye wear choice, but honestly, he is more like Worthy in his play on the court. He just needs to watch some of James' videos to get his spin moves down. And the Worthy goggles would not work for Jaylen. He needs the studious-intellectual look. He already has the substance.